Previous Metal Halide lighting resulted in a huge amount of heat when left on for long periods. Chillers were often needed as the water temperature could spike when the light was on. LEDs on the other hand run very cool for hours at a time. LED lighting has become very affordable over the last 5-10 years. They are low cost and can deliver extremely high outputs. Most LED lights will last in excess of 40,000 hours without needing replacement. This equates to tens of years of aquarium use. LEDs are also low wattage and consume little energy for powerful output. 2016 has some excellent, affordable and coral ready lights for the marine aquarium. In fact there are many MANY units available on offer. 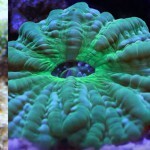 This review covers the most popular fixtures available – the best led lights for growing coral. Prices range from sub $100 to $500+. We will explore wattage, size and which is the best value for your dollar. This article runs through the best LED lights for growing coral in the hobby and gives the advantages and disadvantages of each LED unit. The USA Orbit Marine Aquarium LED Light is one of the most popular saltwater aquarium lights. It is also one of the best LED lights for growing coral for the beginner coral aquarium. The light comes in standard sizes and will fit most marine aquariums. It has a controller and computer that enables light ramping, moonlights and more. The light also has the ability for colour adjustment so you can choose a temperature that best suits your tastes. It is best lights in terms of cost for low tech or FOWLR setups. However, if you are looking for a super high intensity light, to grow SPS hard corals for example, the USA Orbit is not the best choice. Users report positive results growing SPS in very shallow tanks (less than 12″) but deeper aquariums are not recommended. This light is recommended for enthusiasts that want to grow softer corals at shallow depths (Between 0 and 2 ft). Any deeper and you will need to purchase a light with higher intensity and shallower focus. The light is very low cost. Especially for a marine light capable of growing beginner corals. At the time of writing the light ranged between $110 and $180 dependent on size. Reportedly very good customer service from the brand. Not the best light for keeping hard corals or SPS. The only real downside is power. If you need super high wattage this light is not for you. The Euphotica dimmable and programmable LED marine light is an excellent choice for the reef keeper. It is a SUPER bright 165w LED fixture (That wattage is for the 16″ model) that is great for growing corals, even at depth. The light comes in a number of lengths up to 32″ and should cover most enthusiasts setup. It is very popular due to its low price and high output wattage. A significant number of enthusiasts have reported positive results using this light. Its one of the best LED lights for growing coral on a budget. The light is sturdy and well built. It incorporates basic programming that allows for sunrise, sunset, moonlight and other options. The flexibility also allows lowering of the light intensity for FOWLR setups or maximum intensity for SPS setups and frag tanks. Its spectrum is impressive and mimics many of the higher end lights on the market – without breaking the bank. Its a great light for those looking to enter the coral growing hobby and users can expect great results. The company has impressive examples of coral growth on their website. Very intense lighting on the highest settings. Capable of growing all corals including SPS. Is a great choice for a shallow frag tank. The fan is very quiet and the light runs cool despite its higher wattage. It won’t heat up the entire room like a metal halide. Very easy to switch between daylight, moonlight, cloudy etc modes with the click of a button. Modes are simple and not as unnecessarily complex as other brands. Programmable modes to specify lighting at certain times of the day. 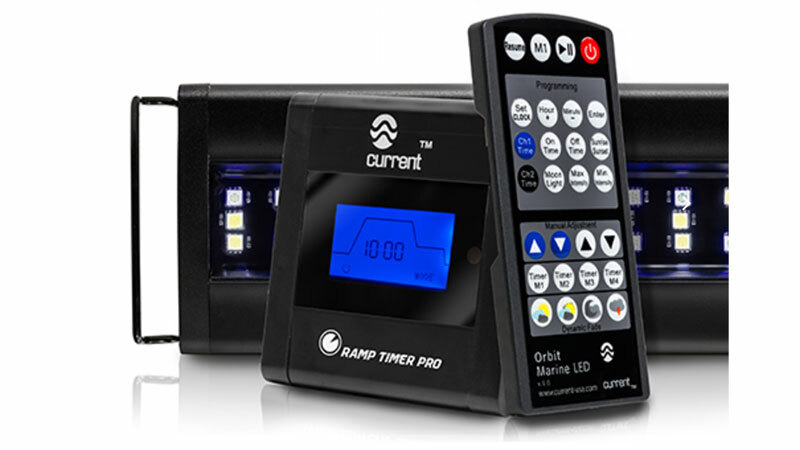 This is a great addition for viewing corals and invertebrates that respond to changes in light. Great for deeper tanks as the light is very intense. Lowering intensity is possible for shallower marine aquariums. Good mix of stock colored LEDs that cover the spectrum required for growing corals. 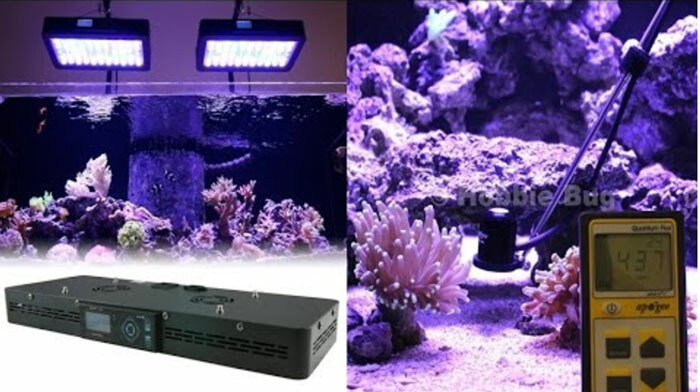 There are many positive reviews in which users praise the light for coral growing. One of the best LED lights for growing coral as it incorporates both high wattage, low pricing and programmability all-in-one. Less functionality when compared to higher end expensive lighting units. Lacks some customisation. Covers to the width of the light, longer tanks may end up with dead spots at the ends if the light does not match the tank length. 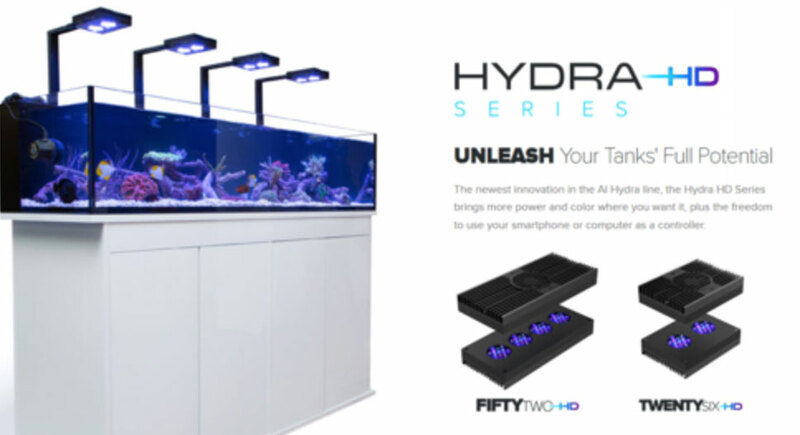 The Aqua Illumination Hydra Twenty Six is a marine coral LED lighting system for the aquarium. It takes some of the best parts of popular lights (such as the Radion XR30w) and makes them a lot more affordable whilst upholding the quality. It has 26 LEDs with 80 degree lenses and 8 individually controllable colors. Its a great light for the marine aquarium. The light has accurate color representation and can output any color at 90W. Growing coral is possible down to a depth of 24″. The big sell of this light is not requiring an external controller to run single or multiple units. It is wifi capable and will respond to commands via your smartphone. This is definitely not a light for bargain hunters. However, its a good compromise for those not willing to fork out for top end lighting fixtures. 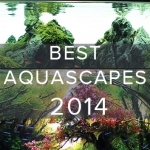 Looks stunning on the aquarium, especially when mounted from the ceiling or braces from behind the tank. Ergonomics are a big part of this light. Unused power from other LED’s can be output to other Colors using the HD (Hyper Drive) functionality. It means your light can still output 90W at your chosen spectrum. Wireless and has the functionality to work with the use of your smartphone. This includes changes made through wifi from locations around the world. Uses very similar hardware and LED’s to the Radion XR30w G4 at a much lower price. Allows you to save settings and upload other peoples settings to your unit. More expensive than other lights that offer the same wattage. 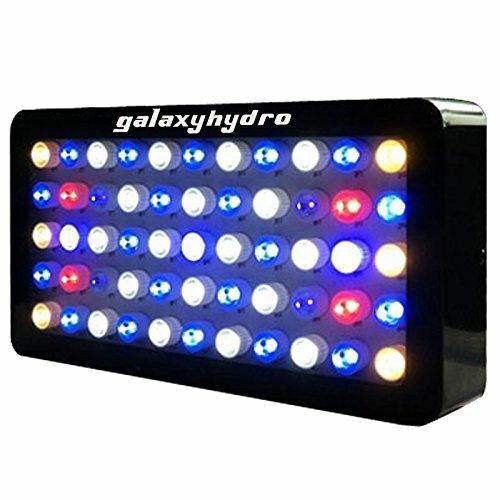 The Galaxy hydro LED dimmable unit is one of the most popular on the market. Its one of the best choices for value in the marine hobby. You are essentially paying base cost for the LED parts and drivers in a metal shell. All functions are manual but the output is extremely impressive. 165w for a sub $100 unit is mind blowing. Thats 55 LEDS at less than $2 an LED! Especially considering how expensive some units are that offer half that wattage. Users have consistently rated this light highly. The light runs very quietly and has been proven to grow all species of coral, including SPS varieties. Its an excellent light for those starting out in the hobby as it allows keeping of corals without breaking the bank. The light intensity can be increased as confidence and experience grows. Its also an excellent light on those looking to setup a very large aquarium, frag tank or even an aquarium store. Purchasing multiple units of other brands can be extremely costly. But most users don’t require the fancy settings, wifi capability or advanced programmability. For this reason it is one of the best LED lights for growing coral when budget is a constraint. 165w of LED lighting for under $100 is an incredible deal. The fan runs very quiet, it keeps the unit cool without intruding on the experience. Manual settings are sometimes favoured to electronic/wifi settings which can be difficult to setup and use. Great for very large aquariums/frag tanks that require many lighting units. These purchasers can save hundreds if not thousands of dollars when purchasing this cheaper unit. Lack of functionality, all settings are manual requiring you to use your own timer and setup. This means no thunderstorms and sunrises! The light lacks the polished sleek look of higher end lights. This can be easily fixed by keeping the light in a hood or hanging it from the ceiling. Can be difficult to get the right setting for your corals and then keep/remember that setting. 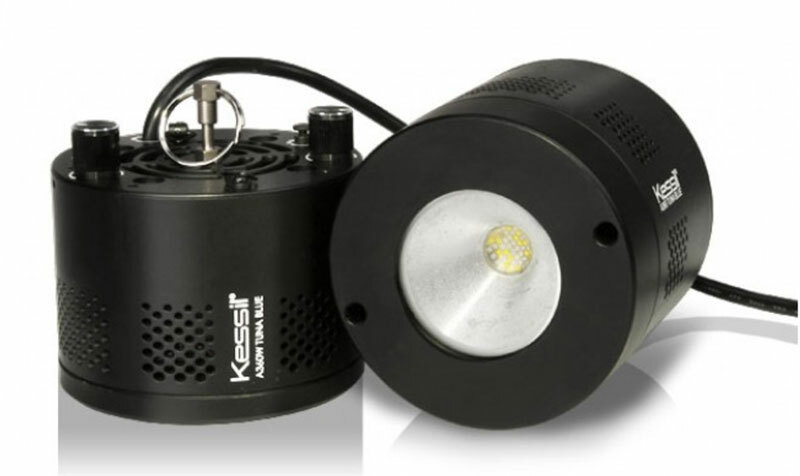 The Kessil A360WE Controllable LED Aquarium Light is an excellent choice for the marine aquarium enthusiast. This light is small and ergonomic. Its hard to understand how such a small unit can output very high intensity. Kessil A360WE have great coverage (24 x 24″) which means most users can get away with just two units over a 4′ + setup. They shine from a single point and have noticable shimmer. The shimmer is similar to the sun shining into the ocean and is a very nice effect. The Kessils are renowned for great color and the A360WE is no exception. The A360WE is one of the best LED lights for growing coral for users who want a sleek, refined and simple setup. The Kessil is powerful and well priced against competitors. Sleek, great looking light with a very small physical footprint. It is surprisingly bright and looks great mounted above a cube. 24″x 24″ coverage is impressive for a light of this size. Only a few units are required for much longer tanks whilst still being able to grow corals. 90W of power is more than enough for most users. Their optimisation of intensity (up 15% from the previous models) makes this light more efficient than cheaper models with more LEDs. Shimmer that is similar to sunlight on a real life reef.. Expensive light for a small unit. The light can exceed $400 per unit which can be costly for larger aquariums. Coverage is generally in a square shape. 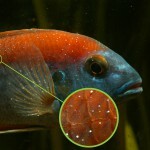 It’s not as effective for thin or narrow aquariums. Less customisation of other units when changing color. When you thought that the LED wattage race couldn’t get any crazier, there is the Globa Star 300W LED unit. Not only is the wattage doubled from similar units, the price has been kept around the $100 mark. If you’re looking for value for money, this is your light. Users have claimed success growing difficult SPS at depths of more than 24″ on intensities of just 50%. Its very bright and a great choice for those concerned with growing SPS or difficult coral in deeper aquariums. 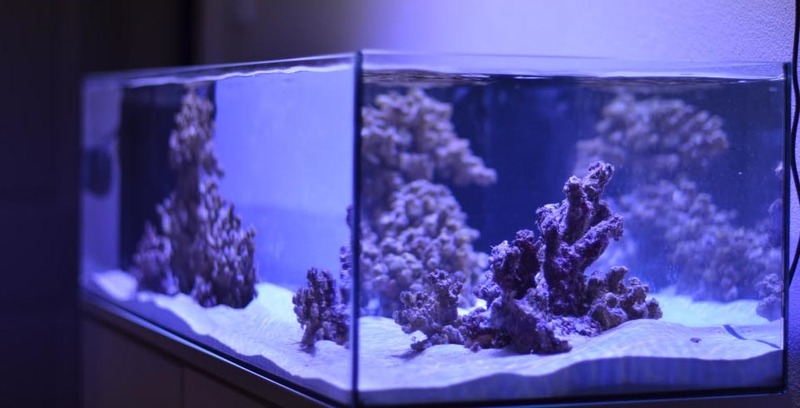 At the other end of the spectrum its a great investment for those who are looking for a beginner coral light and can run this on low intensity. It offers the potential to increase intensity when users become more confident and begin keeping corals with higher lighting requirements. 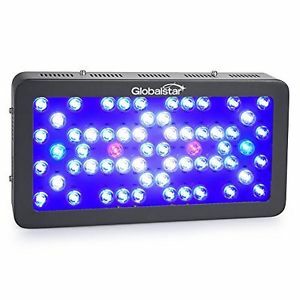 The Globar star is the best LED lights for growing coral, especially difficult corals and SPS that have very high lighting requirements. Ridiculously good value for money. 300W for around $100 is just 33c per watt. If you are building a frag tank this should be your light of choice. The light has received numerous positive reviews from users and few complaints about the efficiency and usability. The fan is quiet and actively cools the unit to safe temperatures. A great choice of light for intermediate or advanced reef keepers wanting to try their hand at keeping SPS. Can be suspended far above the water because of the lights high intensity. One of the best LED lights for growing coral in the hobby whilst being able to do so on a tighter budget. This is especially great for university students or younger members looking to join the hobby. Manual settings lack the ability to custom set modes and have automatic ramping for sunrise and sunset. Some may consider the light ‘too bright’ and can bleach corals if accidentally set on a high setting. Light is not as sleek and streamlined as more expensive models. This 120W LED unit is a sleek unit that can grow both LPS and SPS corals. It is one of the best LED aquarium lights for the marine aquarium intermediate and advanced aquarist. The lighting unit will easily get you to 1-3 watts per gallon for a smaller aquarium. For a larger aquarium multiple units can be purchased to avoid shadowed areas in the tank. The unit is aesthetic and thin and includes metal brackets that hold it on the edge of the aquarium. The brackets can be extended to suit aquariums of all lengths. Well priced light that comes with high wattage and basic programmability. Most lights at this price do not include a built in digital timer. The fans run very quietly and the light maintains a low temperature. The light has great coverage thanks to its width and spread of LEDs. Has had excellent reviews – especially in regards to growing coral. This light grows both LPS and SPS quickly. No settings for ramping up and ramping down ‘sunrise’ and ‘sunset’ settings. There are many great LED lights for the marine aquarium. Each depends on the users budget and unique use case. The the best LED lights for growing coral are those that fit your budget and are powerful enough for your corals. Programmability comes at the sacrifice of higher cost whilst lower costing high wattage LED setups lack the refined styles of more expensive products. Your light is a big investment and should be purchased for the life of your aquarium and beyond. Choose wisely and enjoy the lighting of the future.